Johnny Calzado's Savannah Cardinals were looking to come back in this April 1990 game and Johnny Calzado did his part. With the bases loaded, Calzado knocked a three-run double to left. Those runs tied the game, according to The Greensboro News & Record. It wasn't enough. It was a game Savannah went on to lose. Calzado was starting his second professional season that year. He went on to play professionally in a total of six seasons. He never made AA. Calzado's career began in 1987, signed by the Cardinals as a free agent out of his native Dominican Republic. Calzado was also known by his given name Lorenzo Calzado. Calzado's time with the Cardinals started at rookie Johnson City. He got into 12 games and hit .296. Calzado played the next two seasons at Johnson City, the infielder hitting .213 in 1988 and .287 in 1989. 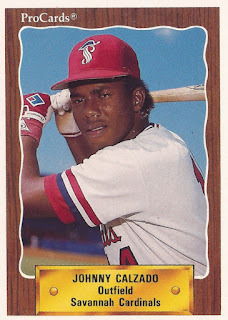 He also got into 23 games at single-A Savannah in 1989, hitting just .133 there. He did pick up two hits in an early April game, scoring twice and knocking in one. Calzado returned to Savannah for 1990. He singled to extend a April lead and tied a June game with another single. Calzado hit one of his six home runs on the year in a late-April contest. He returned to the field in 1991 at single-A Springfield. In 111 games, he hit .236. Calzado's final pro time came in 1992 at Savannah. He got into just six games, ending his career.